What does a commander of a World War II assault transport ship do in his spare time? If the captain is Harry Hammond Hess, he would be gathering geophysical data enroute to Iwo Jima. Later, he would use the data to prove plate tectonics. Geology professor Harry Hammond Hess was born in New York City on this date – May 24 – in 1906. The city was bustling with new immigrants and phenomenal growth. The world’s second largest city, it had nearly five million residents and was adding an incredible million people every five years. Harry Hess’s grandfather, Simon Hess, had started a construction company, which grew to include harbour dredging and dam construction. Harry’s father, Julian, became a member of the New York Stock Exchange. Harry’s mother came from Hammond, Indiana, where her father Julius owned a liquor distillery. That Indiana town was the origin of Harry Hammond Hess’s unusual middle name. From Manhattan’s 22nd Ward, his parents moved to nearby Asbury, New Jersey, where Harry graduated high school with a focus on languages. He entered Yale at 17, tried electrical engineering, but switched to geology, then promptly failed his first mineralogy course. His professor advised him to change his major, convinced there would be no future for Hess in geology. I have great sympathy for Hess’s mineralogy fiasco. Except for the grace of my own mineralogy professor, I might have likewise been tossed from my studies. I am severely colour-blind, which I never disclosed to my instructor. Mineral identification depends on colour recognition and a good eye for shapes and patterns. I have none of that. The results of my lab exam were abysmal. My professor kindly looked for the few things I had accidentally identified correctly and (I suspect) nudged my mark up to a very slim pass. Coincidentally, my professor, Leslie Coleman, had been a Princeton student of the same Harry Hess who had failed his own introductory mineralogy exam. Despite Hess’s lack of eye for mineral structure and thin-section identification, Harry Hess stuck with geology and became one of the most innovative scientists of the twentieth century. Hess finished his geology degree. Then, in a brash move, he left America and spent two rough years in remote northern Rhodesia, working and living in the bush with a native African team. They were prospecting in what is now Zambia, a country rich in copper, nickel, and uranium deposits. 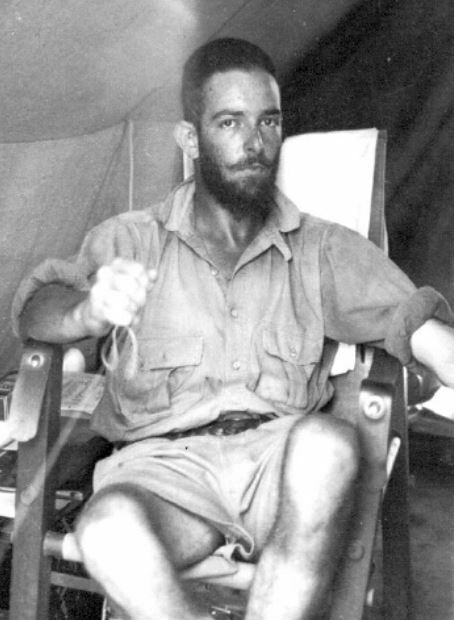 Harry Hess’s son, Professor George Hess, told me that this photo (right) is a selfie which Harry took while camped in Zambia – you can see the string he set up to snap the picture – it’s in Harry’s right hand. After two years, Hess returned to school, enrolling in graduate studies at Princeton in 1929. He once said he would have preferred Harvard, but had noticed “No Smoking” signs in all the geology labs. Knowing he could never give up his cigarettes, he selected Princeton. Princeton, with its lax smoking regulations, was a good choice for other reasons. The geology program was solidly established. And Richard Field, a grandiose geologist who knew how to find research money, was established there. In three years, Hess had his doctorate. He studied a pale green rock called peridotite, an unusual igneous pluton made of olivine material originating deep below the crust, in the upper mantle. Those rocks – his doctoral thesis material – had a similar structure to the last minerals Hess would ever hold in his hands, forty years later, just before his early death from heart disease aggravated by a lifetime of smoking. The final rocks in Harry Hess’s life were small chips of olivine which Neil Armstrong had brought for him from the Moon. Hess had helped make Armstrong’s trip possible – but we are jumping ahead in the Harry Hess story. As a Princeton graduate student, in 1931, Hess assisted one of the first submarine explorations of the seafloor, working with Dutch scientist Felix Meinesz, a geodesy expert who was developing equipment to measure seafloor gravity while on a pitching, rolling boat. This was a near-impossible feat, similar to trying to measure one’s weight while swaying on a bathroom scale. Scales prefer quiet stability, the sort of calm a submarine offers when it sinks below the roiling seas. In the early 1930s, the submarine was the best vehicle to gather a reliable set of gravity data – but not every university had one. Through Richard Field’s formidable connections, Meinesz and Hess were outfitted with a US Navy sub to explore gravity anomalies in the West Indies. Six-foot seven-inch Meinesz worked cramped and hunched – submarines are built for much shorter men – as he measured the Earth’s gravity field by timing the swing of a pendulum. It was the first of many treks to the Caribbean for the scientists. To help with paperwork and approvals, Field made sure the government ranked Harry Hess as a reserve Lieutenant officer in the Navy. Ultimately, Hess would rise to the rank of Admiral. Shortly after their last Caribbean expedition, the scientists were fighting World War II. Thanks to Field’s meddling, Hess was already in the Naval Reserve. The morning Japan bombed Pearl Harbor, Hess reported for duty. His first assignment during the war kept him in New York City, using geophysics to uncover enemy submarine positions in the North Atlantic. The navy was so successful that within two years the German submarine threat was neutralized and Hess transferred to battle duty in the Pacific. As commander of the attack transport USS Cape Johnson, Hess made four major combat landings – including Iwo Jima, the most fierce battle in the Pacific. Hundreds of the 1,500 troops he personally piloted ashore died, though the Americans eventually overpowered the small island’s Japanese defenders. Ferrying troops and supplies around the sea was, of course, Hess’s main assignment. 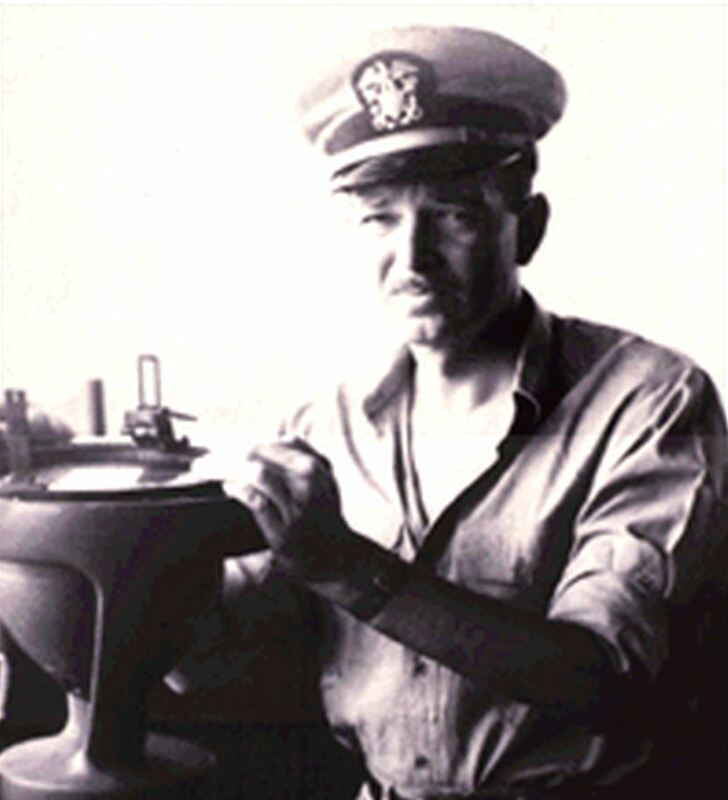 But between his various engagements across the Pacific, Hess gathered oceanographic data for the navy. Like many transport ships, the USS Cape Johnson was outfitted with depth-sounding equipment so the ocean bottom could be mapped – with military applications in mind. The depth-device, the fathometer, helped ships avoid crashing into submerged reefs, rocks, and enemy traps during beach landings, but as the forces edged closer to Japan, vessels with fathometers collected data which the navy turned into the first crude Pacific seafloor maps. Such maps helped captains confirm their ship’s position (often estimated by less reliable compasses and sextants) by noting features like submerged canyons and ridges. Hess and others mapped the ocean floor’s topography, knowing it would help the war effort, but Hess knew it would also be useful data for his science, helping unravel the nature of the seafloor and its evolution. Hess was not disappointed. By mid-1945, Hess had measured many of the Pacific’s nether parts, including trenches ten kilometres deep among the canyons and crevasses that were nearly everywhere. Geologists had thought the seafloor was a broad and flat dirty sink collecting mud from the continents. Quite the contrary, according to the Hess data. The seafloor was alive with unexpected geological activity and unexpected topography. Harry Hess and his colleagues would eventually use these unlikely observations to prove the floor of the ocean was in motion, creeping along in murky darkness. Fifteen years later, in 1960, Harry Hess put the Pacific data – along with his earlier studies from the Caribbean – together into a theory of seafloor spreading. Most of the world’s geologists were fiercely opposed to the idea of spreading seafloors and its corollary, drifting continents, so at first Hess cautiously presented his theory in a manuscript that became widely xeroxed and informally circulated. Two years later, he published “History of Ocean Basins,” within an obscure collection called Petrologic Studies. He anxiously described his work as geopoetry, apparently in an attempt to diffuse some of the criticism he knew it would attract. Hess hypothesized that the seafloor widens at the great global rift system’s volcanic fissures where hot magma emerges. Extreme pressure along the rift forces new ocean crust away from the ridge, then moves the crust across half the ocean. At the end of its enormous conveyor belt, it sinks at subduction zones, disappearing in the mantle. The basaltic ocean crust doesn’t pile up or accumulate. Hess’s spreading, subducting, mobile seafloor explains why so little sediment accumulates on ocean floors. And it explains why ocean crust is relatively young. Hess calculated the oldest ocean crust has survived 300 million years, but continental crust is more than ten times older. Within 300 million years, the new seafloor journeys from rift to trench, then descends into the mantle, never to be seen again. Meanwhile, continental material mostly stays aloft. By this insight, Hess explained the puzzling age difference between marine fossils found on the ocean floor (actually less than 200 million years old) and marine fossils lifted to mountain slopes (sometimes over 500 million years old). Any fossils not safely thrust up onto the non-recycling continents remain in the seafloor mud and are eventually destroyed at subduction zones. Harry Hess, explaining the ocean crust cycle from spreading rift to subduction, 1968. “History of Ocean Basins” had critics, of course. But the paper was well-received by the new generation of scientists. For the first time, a scientific position on mobile continents was attracting more supporters than detractors. Hess’s history of the ocean basins was perhaps the single-most important contribution to the development of modern plate tectonics. His paper was cited more frequently than any other geophysics research paper, geopoetic or not. For a dozen years, it was the source material other geophysicists used when they wrote their own papers. Hess stated that the evidence for mobile continents was strong, however, in presenting his paper, he cautioned “It is hardly likely that all of the numerous assumptions are correct.” But the most important ones were. The oceans spread; the continents move. Harry Hess passed away at a relatively young age. He was just 63 when he collapsed at a meeting of the Space Science Board of which he had been chairman for years. It was in August 1969, within a month of the arrival of the first moon rocks. Hess had been one of ten men in America scheduled to perform tests on those first lunar samples. He made a few preliminary examinations and he hoped further studies would reveal evidence about the Moon’s formation. He lived long enough to see his theory of seafloor spreading and his contributions to plate tectonics widely accepted. Harry Hess, the navy admiral, scientist, and geopoet is buried at Arlington. The preceding was pilfered from my book, The Mountain Mystery, the story of how scientists such as Harry Hess figured out that mountains were formed by plate tectonics. The book is published by Summit Science Publishing and printed by Amazon, where it is available on line. This entry was posted in Biography, Exploration, Geology, History, How Geophysics Works, Oceans, Plate Tectonics, The Book and tagged Harry Hess, Meinesz, oceanography, plate tectonics, sea floor spreading, subduction. Bookmark the permalink.